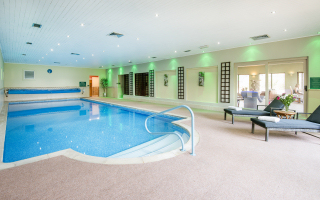 Village Farm Health Club and Spa, near Alnwick in Northumberland, offers a range of private membership options. Our membership packages are designed to suit all our members from full Platinum to winter-only swimming. Please ask if what you are looking for is not shown; we will do our best to find a membership to suit you. In addition to the membership prices shown below, there is an enrolment fee of £25.00 for each enrolment (single or couple). This includes a one-hour induction for the Platinum, Silver and Bronze categories. Please note that holiday-makers staying at Village Farm Cottages and persons having private one-to-one swimming lessons also use the facilities. Some times of the day are busier than others and some children are better behaved than others. However, there are adult-only times in the early morning and late evening every day from 6.15 until 9.00 am and 8.00 until 10.00 pm. Guest passes can be purchased for £5.00 each (or £2.00 for swimmers aged 2 to 16 years on Saturday and Sunday mornings only). Tennis is free to all members and is available at all hours all year. A maximum of three guests may be admitted at a cost of £2.00 per player. NOTE : Where two prices are shown, the first is the price per year and the second is the price per month.